Drive or public transport in? Will it be crowded on Vesak day? Go as early as you can and be prepared for long queues at bus stands and immigration. Good if you're able to stay in touch with your friend so he can gauge your arrival time. I'd say give it a go especially if you're young and mobile enough, judge for yourself what a holiday crowd is like. Is anyone here at CIQ Tuas or Woodlands' side who'd like to give an update on the immigration hall situation? 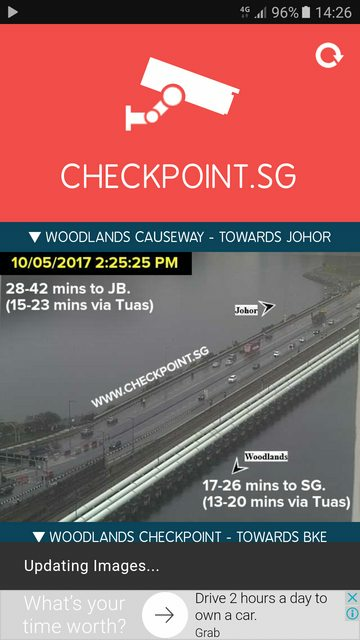 Pretty clear human traffic over at Kranji! Is bus 950 or CW1 better? CW will be my choice. I use this app from playstore to guide me. Today is gd day to go. Midweek. Msian not going back. Exam period. Parents not bringing kids. Past 2 holiday long weekend many pple already went. Today no jam, only MY custom jam for those on public transport. Waited 50mins for counter but other areas all smooth smooth. Coz of frequency or price or any reason? I took TS8 at Great World City, reached checkpoint in less than 45mins, maybe about 35 mins. Anyone has any recommended hotel to stay for one night at JB. I foresee after settling my stuff, it would be quite late to come back to sg. The new Armari hotel looks good but it's a bit ex.